How can they be consolidated by increasing cost and benefit transparency? Companies have been involved in dual training in the Philippines since 1994. However their participation rate is minimal and the dual system of vocational education and training is not the focus of government stakeholders. Greater transparency of costs and benefits relating to company training might contribute to initiating, and empirically justifying, education policy decision-making which is specifically targeted at consolidating this qualification pathway. The article introduces key finds from the cost-benefit analysis as well as survey results which are considered in terms of recommendations for the next steps in the conclusion. The Philippine vocational education and training system is divided into an institution-based sector which is generally a full-time school based model, a community-based which is focused on fast labour market integration and job creation measures, and an enterprise-based. The latter falls under the Dual Training System (DTS) which has been regulated by dual vocational education and training legislation (Dual Training System Act) of 1994. The DTS combines theoretical and practical learning in the school/training centre (40%) and company (60%) learning locations as part of a learning location partnership. Training courses are accredited by the Technical Education and Skills Development Authority (TESDA) which is also responsible for supervision of the Philippine vocational education and training system. TESDA has been a partner institute of the BIBB since 2014. Trainees receive remuneration from the companies providing training. This must be at least 75% of the minimum wage (currently € 8.50 per day). The training agreement is concluded with the training centre. The training period in the DTS varies between three and 36 months depending on the intended qualification. The participation rate of vocational trainees is very low. In 2014, it was approximately four per cent (70,000) of all trainees in the VET system (a total of approx. two million). Over the last ten years, the number has remained at this low level even though the number of trainees in total has increased by approximately 18 per cent (cf. MAPA/ALMEDA/ALBIS 2016). TESDA and the Philippine Chamber of Commerce and Industry Human Resources Development Foundation (PCCI HRDF) have therefore initiated a cost-benefit study in collaboration with the “K to 12 Plus Project”1, University of the Philippines School of Statistics and the BIBB. The study had two aims: On the one hand, it sets out, for the first time, to measure the costs and benefits of training for companies in the DTS. This is intended to make the attractiveness for companies transparent and to stimulate future investment. The BIBB has been carrying out surveys on the costs and benefits of company-based training since the 1980s. The most recent 5th BIBB survey was conducted for the 2012/13 training year (cf. SCHÖNFELD et al. 2016). There is major interest in this analysis model within international collaboration (cf. eg. JANSEN/HORN/NGUYEN 2016 for case studies in Vietnam). Additional benefits comprising those aspects which cannot be evaluated in monetary terms (cf. MAPA/ALMEDA/ALBIS 2016). The study was focused on the four regions with the most companies implementing DTS. In the field phase (from September 2015 to March 2016), trained interviewers/enumerators contacted a total of 481 companies of which 448 provided training within the DTS. A total of 201 interviews were conducted with companies. In small and medium-sized enterprises, it was generally the owners who were interviewed and in larger companies it was the personnel managers, directors or owners. Most companies are based in the manufacturing (40%), wholesale and retail (in particular repair of motor vehicles; 15%), the hospitality sector (11%) and in the construction sector (8%). A total of 26 micro businesses (13%; 1 to 9 employees), 77 small businesses (38%; 10 to 99), 29 medium-sized businesses (14%; 100 to 199) and 69 large businesses (35%; over 200) participated in the survey. 44% of companies offered DTS programmes of up to three months, 37% offered programmes for between three to twelve months and 30% per cent for more than twelve months. In addition to the companies, 21 of the 82 schools/training centres (Technical Vocational Institutes – TVIs) were surveyed. Besides information on the DTS programmes provided, these surveys focussed on issues relating to expenditure and the TVI budget. Moreover, the survey has a rider instrument for the DTS trainees assigned in the companies. The 112 respondents were satisfied with the DTS programme and its relevance to the job market. In the following, selected findings from the company survey are presented. One main focus here is the presentation of costs and benefits (cf. MAPA/ALMEDA/ALBIS 2016). The study shows average gross costs to be approximately € 2433 per trainee per month across all companies surveyed. The costs are € 160 for trainees, € 45 for trainers and € 73 for material and rent.4 At an average of € 104, the short-term benefits cover approximately 43% of the gross costs. For the main part, these short-term are beneficial to the productive contributions of trainees (€ 97). The companies surveyed take on approximately one third of their trainees following the training. A majority of those who leave the company find a position in another company within the sector or abroad. When taking on a trainee, the company is able to make direct savings in terms of personnel recruitment costs. These add up to an average of approximately € 313, comprising € 253 for the recruitment process and € 60 for the induction costs. Productivity differences of € 39 per month between those completing DTS training and personnel recruited externally must also be added, at least at the start of employment (cf. Table). 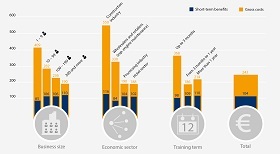 The Figure shows how the gross costs and short-term benefits differ according to the size of company, economic sector and duration of training. Compared to the existing findings for Germany, an unfamiliar picture emerges for gross costs according to size of company. Micro businesses have the highest costs at € 409, while the large businesses with more than 200 employees show costs at just less than half the costs per trainee and per month at € 190. 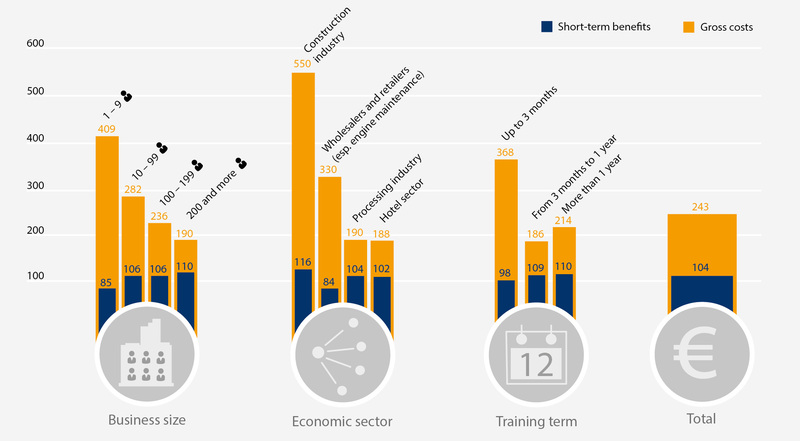 Besides having the highest gross costs, micro businesses also have the lowest short-term benefits from training (€ 85). However, differences by business size tend to be lower in this case. The differences between the economic sectors are also more pronounced for gross costs than for short-term benefits. At € 550, by far the highest cost by some distance occurs in the construction trades. Costs for companies in the engine repair sector are also above average at € 330. In both the processing industries and the hotel sector, gross costs are just under € 200. Short-term benefits range between € 84 in the engine maintenance area and € 116 in the construction industry. 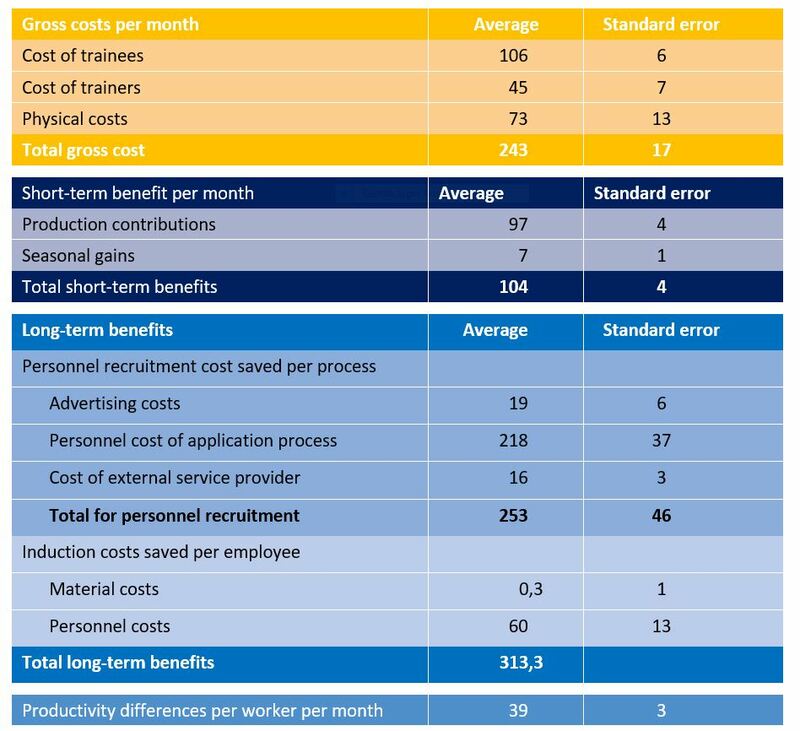 The highest gross costs (€ 368) and lowest short-term benefits (€ 98) are measured in the shortest forms of training (up to 3 months).5 For training terms of up to a year, average costs are €186 and short-term benefits € 109. For longer training terms, costs are € 214 and benefits € 110 per trainee per month. It is evident overall that companies are prepared to make substantial investment in DTS trainees. The two case studies (cf. Information Box) show how these investments benefit the company in different ways. In addition to the benefits shown so far, training in the DTS, can also improve for example the image of the company among customers, suppliers and personnel and in so doing generate and benefit. The vast majority of businesses (above 80%) confirm this positive effect. Training lasting three months in the hotel industry incurs total gross costs of € 564. By contrast, the total short-term benefit is € 306. If a company takes on a trainee, it can make recruitment cost savings of € 369. Assuming that, up to three months following training, the DTS graduate provides productivity advantages compared to those not trained in the DTS (€106), this results in an average overall benefit of € 217. For training lasting 18 months in the construction industry, gross costs of € 3,420 and short-term benefits of € 1,872 are incurred. A further € 328 can also be saved if a trainee is retained. 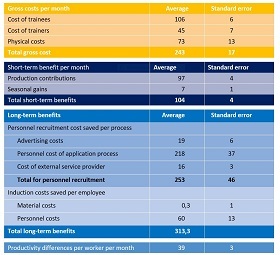 The former trainees are approximately € 41 per month more productive than externally recruited employees. This difference would have to persist for more than two and a half years in order to offset the costs. Further benefit aspects were generated in particular for the construction industry in the planning of the survey. For example, the DTS training may result in less wastage and less accidents thereby saving costs. However the surveying of precise cost savings proved to be complicated. The majority of companies appear satisfied (65%) or even very satisfied (26%) with their participation in training in the DTS. Despite comparatively high levels of investment in some cases, for them the system appears to represent a worthwhile model for the development of skilled workers. The additional survey at schools and training centres (cf. MAPA/ALMEDA/ALBIS 2016, p. 74 f.) shows that regular communication between TESDA and the TVI is crucially important. Various TVIs expressed difficulties in registering for DTS programmes due to complicated procedures and lack of access to companies and their requirements. 78 per cent of trainees surveyed (cf. ibid. p. 75 et seqq.) share the view that the DTS program improved their skill levels, and strengthened their sense of responsibility. 81 per cent stated they had improved their professional skills and competencies as part of the training and 61 per cent said they were satisfied with the training content and process. Almost all trainees are very satisfied with the training personnel and the companies providing training. However, three month programmes are regarded as too short to meet all requirements and to do justice to the skills and competencies which must be delivered. This is confirmed by a range of companies who believe the first three months are needed to deliver basic knowledge and who favour longer programmes of at least six to nine months. The survey of firms’ costs and benefits of the DTS has shown that it is possible for companies to train young people in this system in a way which covers costs. However, at the same time there are also companies who in some cases accept high costs. Consolidation of the DTS is desired by a range of parties not least due to the excellent graduate employment opportunities. If this is to be accomplished, the DTS must be made more attractive for companies. The company surveys and the additional surveys of the TVIs and trainees provide some starting points in this regard. On the one hand, short training terms have high costs, and on the other, all groups involved point to the fact that the short duration is not sufficient for learning the necessary content of the vocational qualifications. In this respect, achieving consensus regarding a minimum training duration should be relatively straightforward. It is currently costing some sectors, and in particular small businesses, to provide training. These businesses must be shown ways in which they can improve the cost-benefit ratio. Best practice examples and targeted seminars could be used to support this. However, forms of financial or personnel support which might be effective must be examined. In some regions, very high costs are incurred due to regional characteristics. The extent to which government financial support can be provided must be examined in order to give companies in these regions the opportunity to provide training in a cost-efficient manner. 2 An exchange rate of 100 PHP = € 1.9 is assumed. 3 In each case “trimmed” averages are presented, i.e. the upper and lower 5 per cent of the distribution is excluded from the calculation. This controls for outlier values. In most cases, in this calculation, the sum of the subcategory averages calculated does not produce the “trimmed” average of total gross costs. 4 The majority of micro businesses are based in the northern Mindanao region. These frequently offer training in the area of repair of motor vehicles. One reason for the high costs among this group could be the high transport costs incurred due to the geographical situation which also impacts on the training costs.